San Francisco, everybody's favorite city, with its icon Golden Gate Bridge, heavy fog, beautiful buildings, Ocean, Bay, and multi-ethnic neighborhoods, makes it the perfect setting for so many mystery novels, films and TV shows. Once again I received an abundance of wonderful articles, reviews and author! author! essays for a themed issue. We're going to have two issues of San Francisco Bay Area mysteries (Volume 24: 3, 4), so I'll be pushing back the other themed issues. The Journal (Volume 24:3) will be out in October. This issue will be available in October online at: Mystery Readers Journal. I'll post more about this issue when it comes out. First issue has articles by Meg Gardiner, Don Herron, Sheldon Siegel, Lisa Lutz, Richard Lupoff and many more great mystery authors who set their mysteries in the San Francisco Bay Area. Kate Atkinson's When Will There Be Good News? Kate Atkinson is one of my favorite writers. When Will There Be Good News? (Little, Brown) completes the 'trilogy' she started with Case Histories and One Good Turn. Jackson Brodie ("I used to be in the police") is at the core of each novel, but the cast of characters in each is what makes the novels so great. Her literary thrillers, as they've been called, are really fantastic puzzles of interconnected lives and events that span many places and times. Her clever plots and beautiful writing keeps the reader engaged and in suspense from start to finish. I read this in one sitting, and once only sad that it was over. When Will There Be Good News? is not a crime novel in the usual sense. It doesn't fit any pattern, and this uniqueness is what makes it such a satisfying read. Nobody really solves anything, but things come together and troubles are resolved. Don't get me wrong, there are a lot of crimes, but they're not so much solved as resolved. Jackson uses her astonishing skill of giving us multiple voices and multiple mysteries in one narrative. I particularly liked Reggie Chase, a 16 year old orphan wise beyond her years. It was also great to see Detective Chief Inspector Louise Monroe, not your usual cup of tea in this novel. In an interview that Amy Cox Williams Atkinson said she's completed this trilogy, but she doesn't rule out bringing Jackson Brodie back. I certainly hope she does--and Reggie with him. Also when asked if there are any crime or mystery authors she's been fond of over the years, she said Harlan Coben, Lee Child, and Laura Lippman. Good company. Kate Derie, Associate Editor, Mystery Readers Journal, is best known as ClueLass. She's been the editor of Cluelass for many years. I knew she was closing down the website, but her fans will be happy to know that she will continue to edit Mystery Readers Journal. It's very sad. Kate's Cluelass site and Deadly Directory were a great service to the mystery community. Times change, technology changes, and projects generated from the heart can't continue forever. Here's a note Kate sent to The Rap Sheet, one of my favorite sites for up to the minute info, reviews and so much more. I’m sorry to announce that Cluelass.com is closing down. After 13 years, it’s time for me to pursue other interests. Thank you to everyone who has sent messages over the years. Dave Robeson has sent us a farewell extravaganza of over 500 books, available at the usual place (http://cluelass.com/Shelf/FullShelf.html). The database will be taken down, but information about books from your favorite authors is available at Fantastic Fiction (http://www.fantasticfiction.co.uk). For those of you looking for information similar to what our Deadly Directory and Mysterious Home Page has provided, you might try Mystery Readers Journal (http://www.mysteryreaders.org), for links to bookstores, magazines, and associations. It’s also a wonderful magazine with articles by many of your favorite authors, new and old. Several authors offer their services to bookclubs. They ask to visit, offer books, suggest conference calls. Most book groups like this, but I've had notes from a few who feel they're being bombarded by authors. My feeling is that this should be the worst of their troubles. One can always say no. Some of the authors can be intense with their marketing methods, but I find that most are pretty lowkey. N. M Kelby has a few contests and book club offers that came across my email yesterday, and I thought I'd share it will you. I'd like to make an offer to the membership, if I can. 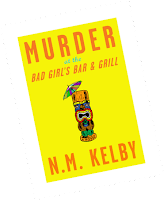 I would like to give each book club one copy of MURDER AT THE BAD GIRL'S BAR AND GRILL. The first 20 clubs to e-mail me at nmkelby@yahoo.com will receive a book. If the book is chosen for the club, I have a special gift pack I send out. I am also available to speak to the group via phone. There's also a contest. I'm giving away $100 gift certificate for the bookstore of your choice. Here's the link. Don't forget to check out the Mystery Readers International list of Mystery Book Clubs/Reading Groups. Send your group, location, meeting times, contact emails and phone numbers, what you're reading and anything else relevant. See the MRI, NorCal chapter, Fall reading list in this blog. Somewhere, and I think it was the Sisters in Crime newsletter, I read that books 7 and 8 in Jacqueline Winspear's wonderful Maisie Dobbs series sold to Harper. Also, the TV rights to this popular series were sold to Sally Head Productions, producer of the Prime Suspect series. Cool! Looking forward to reading and viewing. Jacqueline Winspear won the Macavity Award in 2006 for Pardonable Lies. Charlaine Harris, author of the Southern Vampire series featuring Sookie Stackhouse has hit the big time. True Blood starts Sunday on HBO. Who doesn't like a vampire? Harris's vampire is unique, and this series should be good since it comes from Alan Ball ("Six Feet Under'). Show stars Anna Paquin and Stephen Moyer. Sounds intriguing and exciting. Good going, Charlaine. The Sookie Stackhouse series is great. Don't think the series will come directly from the books, so go out and get them and start reading. You won't be disappointed. HBO website has lots of tie-ins to the show: a graphic novel, a Tru Blood Beverage!, t-shirts and more. You can also sign up for the newsletter, view behind-the-scenes video and find links. There's even a True Blood Community Board. Just finished The Likeness, and Edgar Award winner Tana French’s second novel is as good or even better than In the Woods, a book that won many mystery awards. Cassie Maddox from In the Woods is at the center of this novel, which is written from a totally different point of view. It’s said that everyone has a doppelganger, a double, but when a woman is discovered stabbed in a cottage, she not only looks like Cassie, but she is identified as Lexie Madison, an undercover alias created for Cassie a few years before. Although this may sound a bit far-fetched, French treats it so well that it’s the irony of the situation that draws you into the book. Cassie goes undercover again to discover who murdered ‘Lexie Madison’ and who was Lexie Madison. Her discovery is as much about herself as it is about the victim. This novel is both character driven and plot driven. French does a great job of delineating the four graduate student housemates with their interrelationships, distinct personalities and motivations. The house where these students live is also a character, and the house defines them. Even if you get lost in their idylls, you're back up front and close to center with Cassie, as she searches for the killer of Lexie, who made up the fifth of this ‘merry’ band. I learned a lot about undercover skills that are integrated, defined and revealed in this book. The whole plot revolves around the theme of ‘likeness’-- who's who and who you really. French’s writing style is dense and descriptive. The Likeness is a long book, but one I couldn’t put down. I highly recommend this exceptional mystery. Read an essay by Tana French from the Mystery Readers Journal. Who doesn't like chocolate? There are so many mysteries devoted to chocolate, but rather than list them all, I thought I'd sweeten your day with a recipe for a Deadly Chocolate Flourless Cake. A little background on all the chocolate in our office: Murder on the Menu/TeamBuilding Unlimited (my other hat) does an awesome chocolate tasting. We usually give our clients all the chocolate that's leftover after a tasting, and we bring bags to make it convenient. Nevertheless, even though we do our best to give chocolate away, our office always seems to be filled with lots--from 40% to 90% cacao-- from many different chocolate companies and regions. So yesterday I decided to make use of some of that left over dark chocolate. I found a very easy fantastic recipe for a flourless chocolate cake. For the recipe go to my other blog: Murderous Musings/Team Building Talk. Labor Day. Here's a book for the day. Labor Day Murder by Lee Harris. This is the tenth in her series of holiday-themed mystery novels featuring Christine Bennett, a 30 something blonde who left the convent after 15+ years to find love, marriage and motherhood soon there after. She also began solving murders. Labor Day Murder takes place on Fire Island at the end of the summer. I love mysteries that have a theme, so it's not surprising that the Winter issue of Mystery Readers Journal will focus on Crime for the Holidays. Halloween is a natural, as is Christmas, but I've already received lots of articles that focus on other holidays such as Thanksgiving, both American and Canadian, Guy Fawkes Day, and Guy Fawkes Day. I'm still looking for articles, reviews and Author! Author! essays for the Crime for the Holiday issue. I'll be posting a list of Halloween mysteries in October, so please send me titles.